Esther Heyer farms with husband Harley in SE Minnesota. Ester’s farm is “Heyer’s Out on a Limb Orchard and Gardens”. The first blog I posted about my project “Rooted In the Land” included a painting of their daughter Bethany on the farm with her baby pigs. 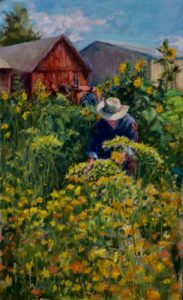 This pastel painting is of Esther picking calendula from her garden to make her healing mixtures. The diversity of their farm produce, livestock and food items is remarkable. Esther’s calendula garden was beautifully bright and sunny! Can you spot the red tractor? Part of what Esther loves about bringing her products to the Winona Area Farmers Market are the wonderful people she meets there. I’m sure her customers feel the same way about her. the arts & cultural heritage fund.